If well cared for, an orchid can live for centuries, but orchids are famously finicky. If you want your orchid to live up to its potential, you will have to care for it diligently--and not just when it is blooming. 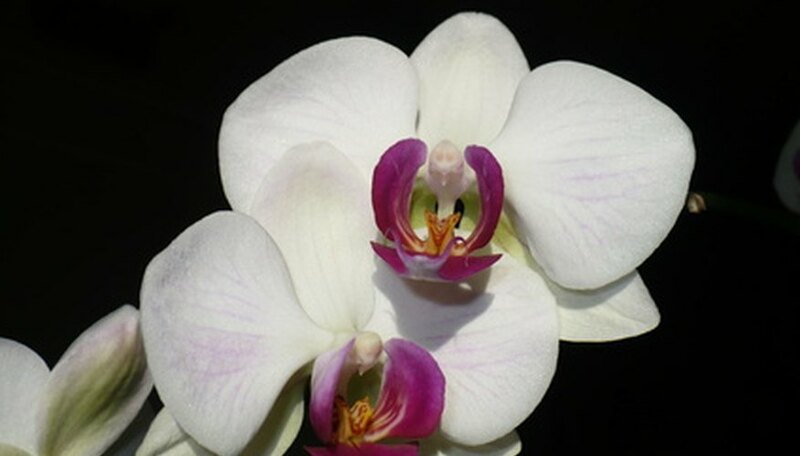 Orchids are doted on when they are blooming and beautiful, but they are often pushed to the side when between blossoms. However, orchids need just as much care when not looking their best. If your orchid is healthy, proper after-bloom care may result in another, bonus round of blooms. "Dead head" or prune any stems with dead flowers on healthy orchids. Use a pair of sharp pruning shears to cut off the stem just below the lowest bloom and just above the nearest node (the joint or swollen area on the stem that produces new flowers). If your orchid is healthy, this may stimulate it to produce new blooms from the node. Cut back the spent stems of small (with leaves only 3 to 4 inches long), young (orchids that have bloomed for the first time) or thin, wilted orchids. Use a pair of pruning shears to cut the stem back as close to its base as possible without cutting any of the leaves. This will prevent the plant from re-flowering on that stem, which takes energy that it may not have. The orchid will flower again in a year or so when it grows a new stem. Water, mist and fertilize your orchid as usual. Even though it is not flowering, it has the same nutritional needs. If the stem on a healthy orchid is brown and wilted, it will not re-flower. Cut it off in the manner described in step 2.